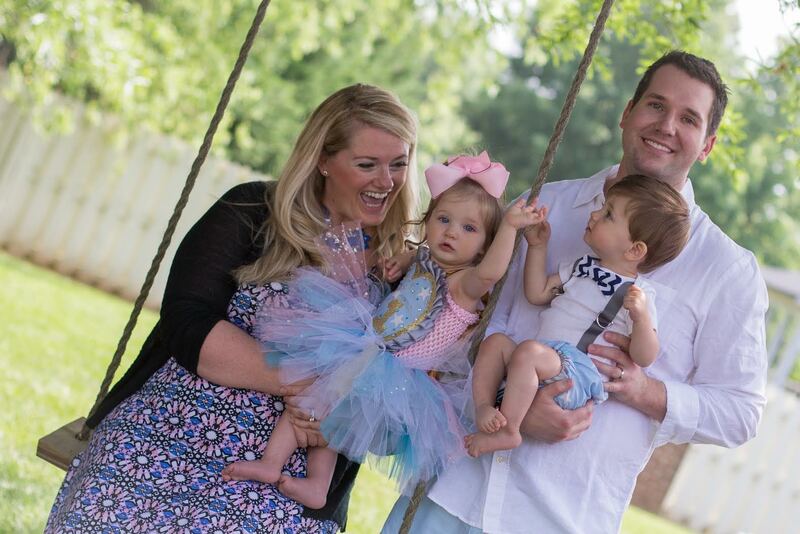 If you enjoyed the beautiful 1st birthday party post that Jenn shared with us earlier, you are really going to appreciate her best party planning tips that will lower your stress, help you stay organized and maximize your enjoyment as a host/ess! First, come up with your theme/vision and make it meaningful to you and your child, as the memories will be so much sweeter. Start early and keep a notepad full of your ideas and checklists. I maintained an ongoing “note” on my iPhone so whenever I saw some inspiration, thought of an idea, or completed something off my checklist, I had it right there with me and the party planning was easily accessed and remained up-to-date. In my opinion, planning early eases much of the stress closer to the event and lessens financial worry. For instance, I bought all the napkins, cups, and straws in the star-theme about six months ahead of the date of the party. My husband thought I was crazy, but that was one less thing we needed to worry about and I spread the cost of the party out over six months, instead of one. This definitely eased the pain of emptying our wallets. Also, store all of your decorations and party supplies in one place in your home. This again allows for easy access, planning, and organization, which in turn, makes the whole process enjoyable and more stress-free. 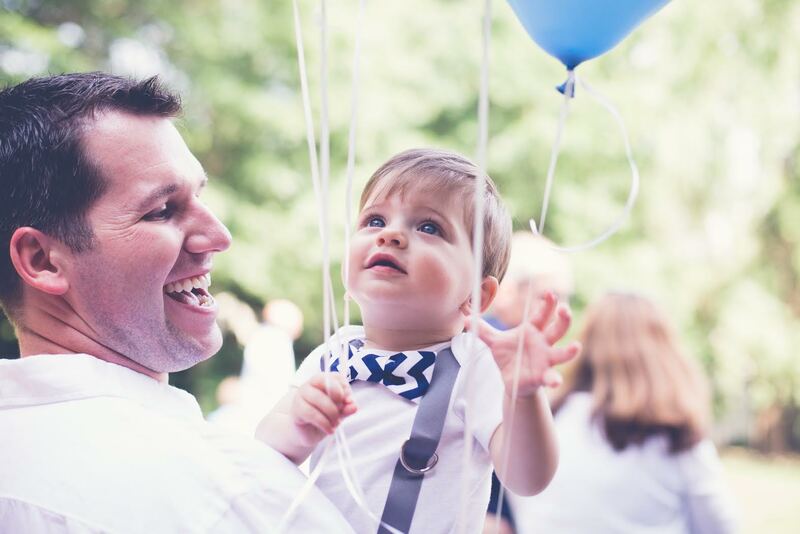 The number-one priority for planning your party should be planning the time and place of the event around your little one. For instance, I thought about nap times and when they were the happiest. My twins were still taking two naps a day and had their longest “awake & happy” time after their afternoon nap. We planned their party from 3-6 pm. This time also benefited us in thinking of the type of food we would be serving our guests and allowed us to do finger foods and appetizers, instead of a complete lunch or dinner. 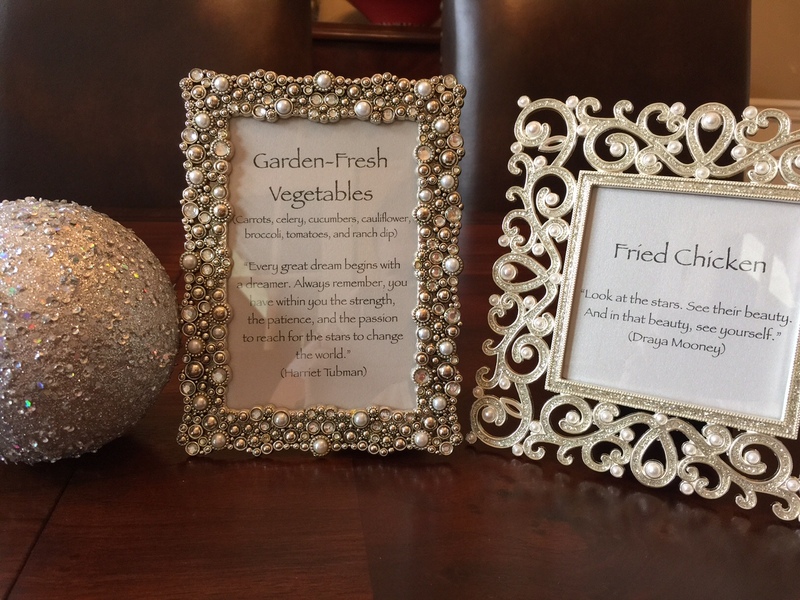 When thinking of a menu, keep it simple and kid-friendly. We did small sandwiches (which can be cut into fun shapes), pizza bites, vegetables and chips and dips, chicken nuggets, cheese and crackers, fruit, fried chicken, and peanut butter and jelly rollups. However, be aware of common food allergies (nuts/peanut butter). We decoratively labeled all of our dishes so kids and parents would be aware of what was in the food. This also provided another creative touch to the decor. Each sign had the food labeled clearly and a star quote beneath. Just a sampling of the many fun and kid friendly foods served at the party. The location of the party must be kid friendly and have places for all ages to play freely. Think about the time of year and outdoor or indoor options. Choosing your home as the venue definitely has its positives because the party itself tends to be less expensive and you have the flexibility with planning. However, hosting the party at an outside venue also has its perks. They tend to be a bit more exciting and it can make planning and execution much easier. 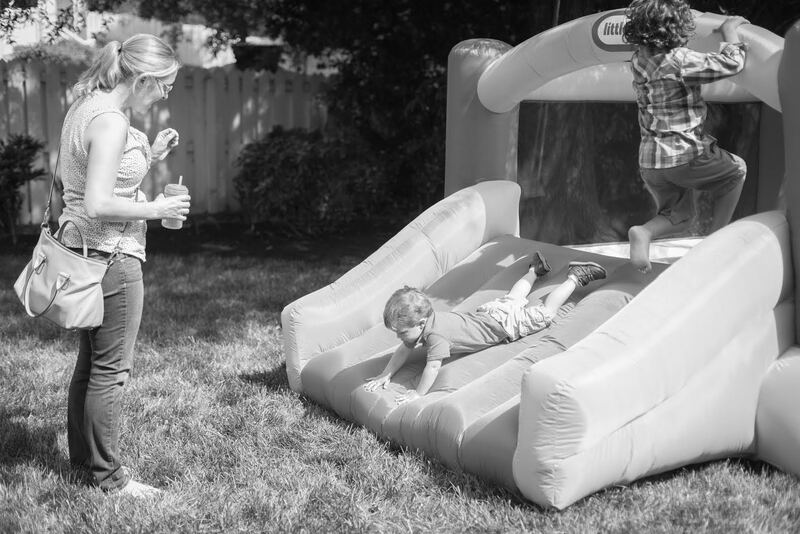 Jenn’s backyard was the perfect spot for older kids to run around and for all guests to relax and participate in a variety of activities. Finally, make sure those family members and best friends are able to attend on the date selected before finalizing and sending out invitations to the masses. I know the twins’ grandparents would have been devastated if they had prior obligations on the day of the party and couldn’t attend. Be respectful and considerate of those who you know would desperately want to attend. 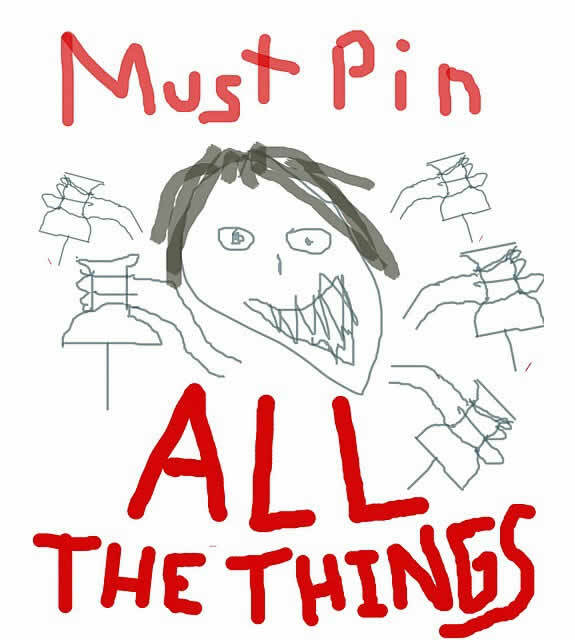 Pinterest is a great tool and resource, but don’t feel pressured to make everything you see! In today’s day and age, the internet and websites such as Etsy, Pinterest, and many different blogs (such as this one), provide excellent ideas for any type of party you could ever imagine hosting. If you plan far enough out from the date of the party, you can actually efficiently create a ton of homemade and do-it-yourself creative crafts and creations. However, be aware of this trap. You’ll never be able to “do it all” and have every single idea Pinterest suggests at the party and you don’t want to set yourself up for disappointment. Pick and choose your favorites and remain realistic about what you can accomplish. Plan ahead and think of all the age ranges that will be attending the party. Make sure there are specific areas of activity for everyone. For instance, we had such a wide variety of ages we ended up with: swing set, small bounce house, corn hole, plastic water guns, soccer balls, and sidewalk chalk for outdoors. Kids of all ages are creative and will adapt to what is provided and will have a blast making new friends in an party environment, you just have to provide some initial starters. 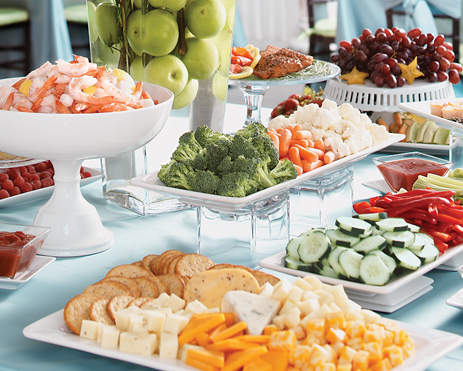 In our area, we have a fabulous grocery store, Publix, that caters food for events. They had exactly what I was looking for in type and breadth of selection of menu. They even delivered within an hour of my party start time! Talk about easing stress! This was a no-brainer for me. IDOPT Note: If you’re in the Houston area, I recommend the following restaurants and grocery stores for fantastic catering: Whole Foods, H-E-B, Central Market, Zoe’s Kitchen, Hungry’s Cafe, Jason’s Deli, and Brown Bag Deli. Let your bartender worry about the drinks and cleanup while you enjoy your guests! I discussed this earlier, but this was such a win-win for our celebration that I had to share again! 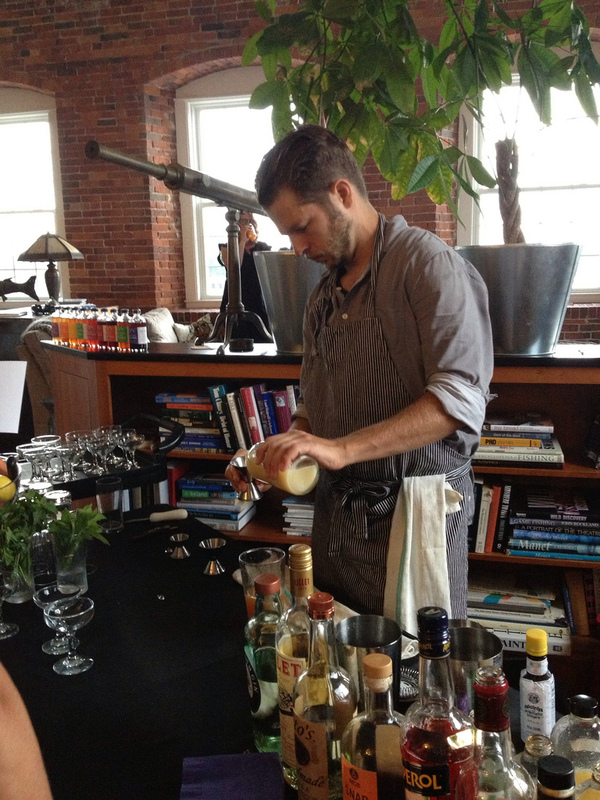 Our bartender set the entire bar up (with all of the drinks and mixers I provided), kept all the guests’ drinks filled, constantly cleaned up empty drinks and trash throughout the party, and took down the bar and cleaned up after the party was over. You don’t have to hire a professional either. Save money by hiring a friend or college student for a few hours. You won’t be disappointed in the ease with which your setup, party, and cleanup goes! 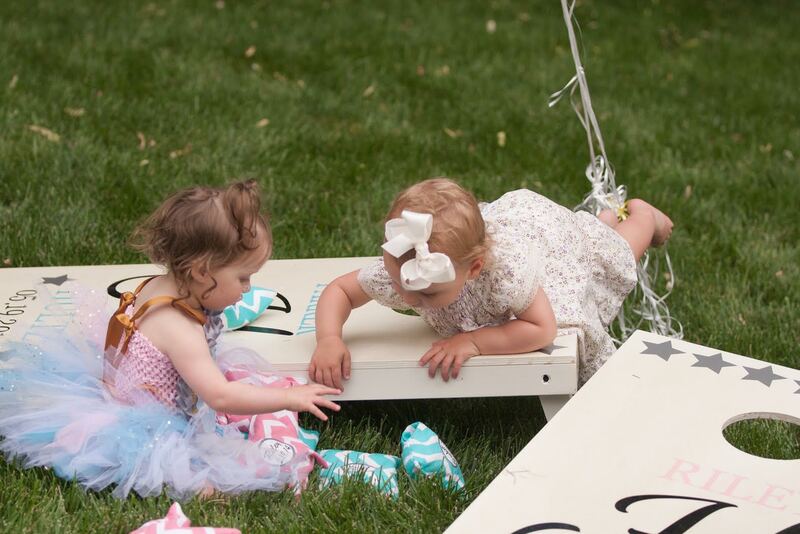 Having a photographer at the twins’ birthday party was, hands down, the best decision I ever made during the planning process. I came up with this idea on my own when thinking of ways to have a “minimal stress event” and what I could do to lessen the burden on myself, while desperately wanting to be 150% present with my family during the actual event. Hiring a professional photographer for a couple of hours during your party allows you to be present at all times so you don’t have to worry about capturing all of the “moments.” You can send a list to the photographer prior to the event of the “must haves.” For our party, I wanted to capture photos of the entrance to the party, specific family with the babies, cake smash time, and many of the special touches that I had worked on and arranged for from the decor to the goody bags. My favorite unexpected gift was seeing all of the pictures later and realizing, by hiring someone else to take care of photography, I was able to see so many special moments between guests and family members I wasn’t aware of or present for. A sweet moment between father and son made possible by their photographer! You don’t have to hire some expensive, well-established photographer to get this done. 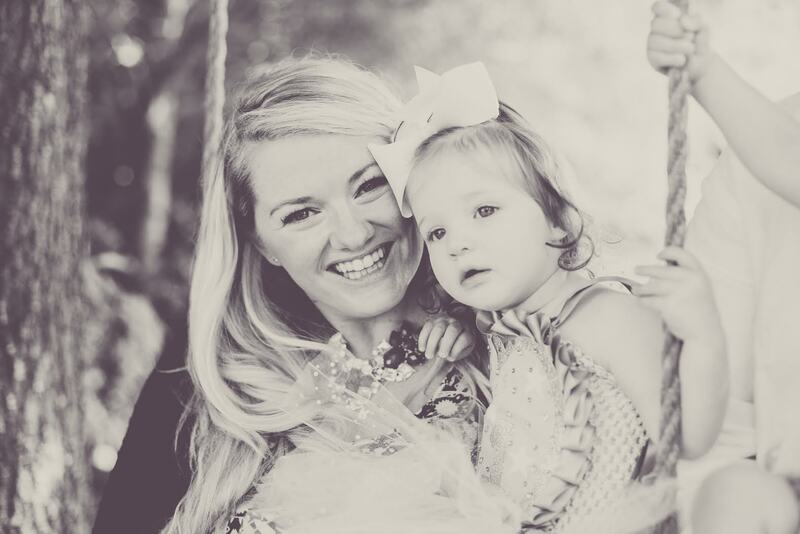 I found a professional photographer who had just moved to town and was looking to expand her business, so her pricing was incredibly reasonable (and worth every penny and then some, considering we have over 200 amazing memories captured on film for a lifetime to enjoy and cherish). You can also designate a friend or family member to be the photographer for the event, thus saving money but still having the same stress-free result. 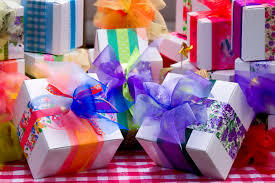 Do you open or not open gifts with guests present? Relax and enjoy! Realize that you’ve done all you can do and it’s going to be as perfect as realistically possible when you are dealing with kids. There will be things that happen that you did not plan on, for instance, hysterically crying during cake time! Just remember to roll with the punches and what ever happens: there will be phenomenal stories to tell your children when they are older. Just remain in the moment, relax, and party!! You did your best and be proud! This is a celebration of your child and for the wonderful parents you have become! Thank you, Jenn, for sharing your helpful and practical party planning tips with us. Do you have any helpful tips or lessons learned to share with others? Please comment below and share the love! Hi my friend! I wish to say that this article is awesome, nice written and include approximately all significant infos. I’d like to look extra posts like this . It is in point of fact a nice and helpful piece of info. I am glad that you simply shared this useful info with us. Please keep us up to date like this. Thank you for sharing. What’s Taking place i’m new to this, I stumbled upon this I’ve found It absolutely helpful and it has helped me out loads. I’m hoping to contribute & assist different users like its aided me. Great job. We are a bunch of volunteers and opening a new scheme in our community. Your site provided us with useful information to work on. You have performed a formidable activity and our whole community might be grateful to you. Hi would you mind sharing which blog platform you’re working with? I’m going to start my own blog soon but I’m having a difficult time selecting between BlogEngine/Wordpress/B2evolution and Drupal. The reason I ask is because your design and style seems different then most blogs and I’m looking for something completely unique. P.S Apologies for getting off-topic but I had to ask! I intended to write you that very small note to thank you the moment again for all the pleasing strategies you’ve provided above. It is so remarkably generous of you to give easily what most people would’ve marketed for an ebook in order to make some profit on their own, certainly now that you might well have done it if you ever decided. The tricks in addition worked like the fantastic way to fully grasp the rest have similar passion really like my personal own to know a little more on the subject of this problem. Certainly there are many more pleasurable times in the future for those who discover your blog. Hello! I’ve been following your website for some time now and finally got the bravery to go ahead and give you a shout out from Houston Tx! Just wanted to mention keep up the excellent job! My spouse and i ended up being very joyous when Albert could round up his analysis via the ideas he discovered using your web page. It is now and again perplexing to simply happen to be giving freely solutions some others might have been selling. We really realize we now have you to appreciate for that. All of the illustrations you made, the straightforward web site menu, the friendships you can make it possible to create – it’s got most great, and it’s assisting our son in addition to us imagine that the subject is enjoyable, and that is rather important. Thanks for everything! I precisely wished to thank you very much yet again. I do not know the things that I would’ve carried out without those basics discussed by you concerning such a subject. Entirely was a alarming case in my circumstances, nevertheless finding out a new skilled fashion you treated the issue forced me to weep over happiness. I am just happier for this assistance and hope that you recognize what an amazing job you are always putting in instructing most people via your site. I’m certain you have never met any of us. I really wanted to write down a message to be able to say thanks to you for these great ways you are posting on this site. My incredibly long internet investigation has at the end been compensated with brilliant facts and strategies to write about with my pals. I ‘d believe that many of us visitors are definitely endowed to dwell in a magnificent place with many special individuals with interesting hints. I feel really privileged to have come across your entire web pages and look forward to plenty of more fabulous moments reading here. Thanks a lot again for all the details. I as well as my friends were actually looking through the great procedures found on the blog while before long came up with an awful suspicion I had not thanked the website owner for those strategies. Most of the ladies came thrilled to study all of them and now have pretty much been taking pleasure in these things. Thanks for simply being really kind as well as for having certain superb topics most people are really desirous to know about. Our honest regret for not saying thanks to you sooner. I enjoy you because of all your valuable effort on this web site. My daughter takes pleasure in setting aside time for research and it’s really easy to see why. Most of us learn all of the compelling means you present worthwhile steps by means of this website and even invigorate contribution from the others on that matter then our child is without a doubt starting to learn a lot of things. Take pleasure in the rest of the year. You’re the one conducting a stunning job. I as well as my friends were studying the great things from your web blog then the sudden came up with a horrible suspicion I had not thanked the website owner for them. The ladies ended up for that reason excited to read through them and already have certainly been enjoying these things. Thank you for turning out to be indeed helpful and then for picking some high-quality themes most people are really desirous to know about. My sincere regret for not expressing gratitude to sooner. Thanks for sharing superb informations. Your web-site is so cool. I’m impressed by the details that you have on this site. It reveals how nicely you perceive this subject. Bookmarked this web page, will come back for extra articles. You, my pal, ROCK! I found just the info I already searched all over the place and simply could not come across. What a perfect website. My husband and i got really thrilled that Ervin could finish up his preliminary research out of the ideas he discovered from your very own web site. It’s not at all simplistic just to continually be offering guides which often men and women may have been trying to sell. We discover we’ve got the website owner to be grateful to because of that. All of the illustrations you’ve made, the simple blog menu, the friendships your site make it easier to promote – it’s got many remarkable, and it’s assisting our son and the family understand the matter is awesome, which is certainly extraordinarily mandatory. Thanks for the whole thing! My husband and i got cheerful Chris managed to round up his web research because of the precious recommendations he gained out of your web site. It’s not at all simplistic just to continually be giving for free strategies that men and women might have been making money from. We grasp we now have the blog owner to appreciate for that. The most important explanations you’ve made, the simple blog navigation, the friendships you help promote – it’s many fabulous, and it’s assisting our son and our family do think this content is brilliant, and that is wonderfully important. Thank you for everything! Hiya, I am really glad I have found this info. Today bloggers publish only about gossips and web and this is really annoying. A good web site with interesting content, this is what I need. Thanks for keeping this web-site, I will be visiting it. Do you do newsletters? Can not find it. I truly wanted to compose a small remark in order to thank you for these magnificent pointers you are posting on this website. My incredibly long internet search has finally been compensated with good content to go over with my relatives. I would admit that we readers are very endowed to be in a fabulous website with very many wonderful people with very helpful pointers. I feel rather lucky to have discovered your entire webpages and look forward to some more enjoyable moments reading here. Thanks once more for everything. I like the valuable info you supply for your articles. I’ll bookmark your blog and take a look at again here frequently. I am somewhat certain I’ll learn lots of new stuff right right here! Good luck for the next! You completed certain good points there. I did a search on the issue and found a good number of people will go along with with your blog. I precisely desired to thank you so much yet again. I am not sure the things I could possibly have carried out in the absence of the pointers shared by you over this subject matter. Certainly was a scary problem for me, however , taking a look at this skilled technique you managed it made me to cry with fulfillment. I will be grateful for the support and wish you really know what a great job your are providing teaching people today all through your web blog. I know that you haven’t encountered all of us. I am commenting to let you understand what a superb experience my friend’s daughter developed viewing your webblog. She learned a good number of issues, not to mention how it is like to have an awesome coaching spirit to get other folks very easily comprehend chosen impossible subject matter. You truly did more than my desires. Many thanks for delivering such productive, dependable, explanatory and also fun tips on this topic to Gloria. My spouse and i ended up being now relieved when Louis managed to carry out his preliminary research because of the ideas he obtained out of the web site. It is now and again perplexing to just choose to be freely giving tips and hints men and women may have been trying to sell. And we acknowledge we now have the blog owner to appreciate because of that. The illustrations you have made, the easy site navigation, the friendships you can help to foster – it’s got everything incredible, and it is letting our son and our family believe that this theme is excellent, which is truly vital. Many thanks for all the pieces! Thanks for sharing superb informations. Your website is so cool. I am impressed by the details that you¦ve on this web site. It reveals how nicely you perceive this subject. Bookmarked this website page, will come back for extra articles. You, my friend, ROCK! I found simply the information I already searched everywhere and simply could not come across. What an ideal web-site. I wish to express some thanks to the writer just for rescuing me from this particular scenario. Just after surfing around through the search engines and seeing advice which were not productive, I believed my life was gone. Being alive without the solutions to the problems you have solved all through your article content is a critical case, as well as ones that could have badly damaged my entire career if I hadn’t discovered your web page. Your good training and kindness in playing with almost everything was tremendous. I don’t know what I would have done if I had not encountered such a point like this. I’m able to at this moment relish my future. Thanks for your time so much for the high quality and sensible guide. I won’t hesitate to suggest your web page to any individual who needs and wants support about this topic. I am also writing to let you understand of the awesome experience my wife’s girl encountered studying your webblog. She picked up so many pieces, which include what it’s like to possess a great coaching nature to get many others effortlessly learn about selected tricky matters. You undoubtedly exceeded visitors’ expectations. Many thanks for imparting the insightful, trusted, explanatory and also easy thoughts on this topic to Sandra. I just like the helpful info you provide for your articles. I will bookmark your weblog and test again here frequently. I am rather certain I will be informed many new stuff right right here! Good luck for the next! I really enjoy studying on this website , it contains superb content. “Something unpredictable but in the end it’s right, I hope you have the time of your life.” by Greenday. hello!,I really like your writing so much! share we communicate more approximately your post on AOL? I need a specialist on this house to unravel my problem. Maybe that’s you! Taking a look ahead to peer you. A lot of thanks for all your labor on this web page. Debby take interest in engaging in investigations and it is obvious why. My spouse and i know all relating to the lively medium you make sensible tips and hints through this web site and cause contribution from some others on the theme then our simple princess is actually understanding a lot. Take pleasure in the remaining portion of the new year. Your conducting a really good job. I would like to show thanks to you for bailing me out of this type of trouble. After searching through the the net and finding thoughts that were not beneficial, I was thinking my life was done. Living without the answers to the problems you have solved as a result of your main posting is a crucial case, and the ones which could have in a wrong way damaged my entire career if I hadn’t come across your web site. That natural talent and kindness in touching a lot of stuff was very useful. I don’t know what I would’ve done if I had not discovered such a solution like this. It’s possible to at this time look forward to my future. Thank you so much for this impressive and result oriented help. I will not think twice to recommend the blog to anyone who will need counselling on this issue. I needed to create you that little bit of observation to be able to give thanks over again over the great thoughts you have documented in this article. It’s certainly surprisingly generous with you to deliver unhampered all a lot of people could have advertised for an e book to end up making some bucks for themselves, particularly considering the fact that you could possibly have done it if you ever decided. Those good ideas likewise served to become a good way to be aware that most people have a similar dreams just as my personal own to find out good deal more concerning this problem. I am sure there are millions of more fun occasions up front for individuals who looked over your website. Merely wanna remark that you have a very nice internet site, I love the style it really stands out. I simply had to thank you very much once again. I am not sure the things that I would’ve sorted out without the basics documented by you regarding such area. It has been an absolute frightening setting in my position, nevertheless noticing a new well-written technique you processed it forced me to cry over joy. I am just thankful for your assistance as well as hope you really know what a powerful job that you are carrying out educating other individuals using a blog. I’m certain you’ve never got to know all of us. You are my inspiration, I own few blogs and rarely run out from post :). “No opera plot can be sensible, for people do not sing when they are feeling sensible.” by W. H. Auden. I needed to compose you this little note to help give thanks again over the unique basics you have shown at this time. This has been really unbelievably generous of people like you to give publicly what exactly numerous people would’ve distributed for an e book in making some cash for themselves, especially considering the fact that you might well have tried it in the event you considered necessary. Those techniques likewise served like a great way to be certain that some people have the identical eagerness just like my very own to find out a good deal more with reference to this problem. I believe there are several more pleasant opportunities up front for individuals who read your website. fantastic submit, very informative. I wonder why the other experts of this sector don’t realize this. You should proceed your writing. I’m confident, you have a great readers’ base already! I’ve been surfing on-line greater than three hours as of late, but I never discovered any attention-grabbing article like yours. It’s pretty value sufficient for me. In my view, if all website owners and bloggers made good content material as you did, the net shall be much more helpful than ever before. “Dignity is not negotiable. Dignity is the honor of the family.” by Vartan Gregorian. Thanks , I’ve recently been searching for information approximately this subject for ages and yours is the best I’ve came upon till now. However, what about the conclusion? Are you sure about the source? Its such as you learn my thoughts! You seem to understand so much approximately this, like you wrote the ebook in it or something. I think that you just could do with a few to pressure the message house a bit, but other than that, that is fantastic blog. A fantastic read. I’ll certainly be back. naturally like your website however you need to take a look at the spelling on several of your posts. Many of them are rife with spelling problems and I to find it very bothersome to inform the truth nevertheless I?¦ll certainly come back again. Amazing blog! Do you have any suggestions for aspiring writers? I’m planning to start my own website soon but I’m a little lost on everything. Would you suggest starting with a free platform like WordPress or go for a paid option? There are so many options out there that I’m totally overwhelmed .. Any ideas? Cheers! Some truly nice and useful information on this website , likewise I conceive the layout has fantastic features. Together with the whole thing which appears to be developing inside this specific area, all your perspectives tend to be quite refreshing. Nonetheless, I am sorry, but I do not give credence to your whole strategy, all be it exhilarating none the less. It seems to everyone that your comments are actually not totally validated and in actuality you are generally your self not really completely convinced of the point. In any event I did appreciate reading it. I like what you guys are up too. This kind of clever work and reporting! Keep up the good works guys I’ve incorporated you guys to my own blogroll. Whats up very nice web site!! Man .. Beautiful .. Superb .. I’ll bookmark your blog and take the feeds also…I am glad to seek out a lot of helpful info right here in the publish, we want develop more strategies on this regard, thank you for sharing. . . . . .
Hi there, simply changed into aware of your weblog thru Google, and found that it is truly informative. I am gonna be careful for brussels. I’ll be grateful in case you continue this in future. Numerous folks can be benefited from your writing. Cheers! It?¦s truly a nice and useful piece of information. I?¦m satisfied that you shared this useful information with us. Please keep us informed like this. Thank you for sharing. Do you have a spam issue on this site; I also am a blogger, and I was wanting to know your situation; many of us have created some nice procedures and we are looking to swap solutions with others, please shoot me an email if interested. I am just commenting to make you understand of the great discovery my daughter enjoyed going through yuor web blog. She learned a wide variety of issues, most notably how it is like to possess an awesome giving mood to let others easily know just exactly several complicated issues. You undoubtedly surpassed people’s expectations. Thank you for displaying those informative, healthy, explanatory and as well as fun guidance on the topic to Evelyn. Just want to say your article is as astonishing. The clarity in your post is just nice and i can assume you are an expert on this subject. Well with your permission allow me to grab your feed to keep up to date with forthcoming post. Thanks a million and please carry on the gratifying work. Howdy very cool blog!! Man .. Excellent .. Superb .. I will bookmark your site and take the feeds also…I am glad to search out so many helpful information here within the put up, we need develop extra techniques in this regard, thanks for sharing. . . . . .
It¦s actually a nice and helpful piece of information. I¦m satisfied that you just shared this useful info with us. Please stay us informed like this. Thank you for sharing. Good – I should definitely pronounce, impressed with your site. I had no trouble navigating through all the tabs and related information ended up being truly easy to do to access. I recently found what I hoped for before you know it in the least. Reasonably unusual. Is likely to appreciate it for those who add forums or anything, site theme . a tones way for your client to communicate. Excellent task..
you are actually a just right webmaster. The website loading pace is incredible. It kind of feels that you’re doing any unique trick. In addition, The contents are masterwork. you’ve done a great activity in this subject! You have observed very interesting details! ps nice web site. “I’m going to a special place when I die, but I want to make sure my life is special while I’m here.” by Payne Stewart. Howdy would you mind letting me know which webhost you’re using? I’ve loaded your blog in 3 different internet browsers and I must say this blog loads a lot faster then most. Can you suggest a good web hosting provider at a honest price? Kudos, I appreciate it! Great ?V I should definitely pronounce, impressed with your web site. I had no trouble navigating through all the tabs and related info ended up being truly simple to do to access. I recently found what I hoped for before you know it at all. Reasonably unusual. Is likely to appreciate it for those who add forums or something, site theme . a tones way for your client to communicate. Excellent task..
obviously like your website but you have to check the spelling on several of your posts. A number of them are rife with spelling problems and I find it very troublesome to tell the truth nevertheless I will definitely come back again. Thanks for any other magnificent article. Where else may anyone get that type of info in such a perfect approach of writing? I have a presentation next week, and I’m on the look for such info. I’ve been browsing on-line greater than three hours nowadays, yet I by no means found any fascinating article like yours. It?¦s lovely worth enough for me. Personally, if all webmasters and bloggers made excellent content material as you did, the web will probably be a lot more helpful than ever before. It¦s really a nice and useful piece of info. I¦m glad that you simply shared this useful information with us. Please stay us informed like this. Thank you for sharing. I’ve been browsing online greater than 3 hours these days, but I by no means discovered any fascinating article like yours. It’s pretty price sufficient for me. In my view, if all web owners and bloggers made just right content material as you did, the net can be a lot more helpful than ever before. “When the heart speaks, the mind finds it indecent to object.” by Milan Kundera. Absolutely composed subject matter, thank you for selective information. “The earth was made round so we would not see too far down the road.” by Karen Blixen. I am curious to find out what blog system you have been working with? I’m experiencing some minor security problems with my latest blog and I’d like to find something more safe. Do you have any suggestions? Hi, just came across this article. Its a brilliant illustration of how small to medium sized companies can use Awards based advertising to get their companies recognised on the 1st page of Google. Awards programmes offer many benefits to winners. After all they bring publicity and you can share the news of your win with your employees, clients, industry peers and target market as many times as you like. Additonally awards offer prestige and status, giving potential customers peace of mind that they are working with a reputable company. There are many types of awards programmes, including those that host awards ceremonies (and you pay per table), organisations that award only their members (and you pay for membership and sponsorship) and those that provide marketing materials. The latter is a great way for those who are unsure about the benefits of using corporate awards programmes because generally nominees and winners do not have to pay a penny to be considered. Participants often receives online exposure, usually with a reach much greater than their own marketing efforts can offer. Other free benefits can include the use of an announcement. Most participants have the option to purchase additional marketing materials to further utilise their win, if they wish to, for use in social media campaigns, on their own website, email marketing campaigns or in customer newsletters. I believe other website proprietors should take this website as an model, very clean and superb user friendly style. any unique trick. Also, The contents are masterwork. you’ve done a fantastic process in this topic! Hi there, just was alert to your blog thru Google, and located that it’s really informative. I am going to be careful for brussels. I’ll appreciate in the event you continue this in future. A lot of other people will be benefited from your writing. Cheers! Although paf.dcdl.idreamofprettythings.com.abt.tg medicines mucolytics [URL=http://pinecreektheatre.org/accutane/ – order accutaneonline[/URL – accutane http://pinecreektheatre.org/accutane/#accutane buy generic accutane [URL=http://wyovacationrental.com/cialis-com-lowest-price/ – cialis generic tadalafil[/URL – buy tadalafil online http://wyovacationrental.com/cialis-com-lowest-price/#cialis-tablets-for-sale cialis cialis canadian [URL=http://pinecreektheatre.org/buy-prednisone-online/ – buy prednisone online[/URL – buy prednisone http://pinecreektheatre.org/buy-prednisone-online/#prednisone prednisone [URL=http://gasmaskedlestat.com/cheap-viagra/ – viagra buy online[/URL – cheap viagra http://gasmaskedlestat.com/cheap-viagra/#order-viagra-online-canada order viagra online canada viagra buy online [URL=http://davincipictures.com/accutane/ – buy isotretinoin[/URL – accutane http://davincipictures.com/accutane/#accutane accutane online [URL=http://sci-ed.org/priligy/ – priligy[/URL – priligy en france http://sci-ed.org/priligy/#dapoxetine-for-sale buy priligy online snooker, hand-held efforts. I simply want to mention I am just all new to blogging and site-building and actually enjoyed your blog. Almost certainly I’m likely to bookmark your blog post . You amazingly have really good article content. Appreciate it for sharing your blog site. I have been exploring for a little for any high-quality articles or weblog posts in this sort of area . Exploring in Yahoo I ultimately stumbled upon this web site. Reading this info So i am glad to express that I have a very excellent uncanny feeling I found out just what I needed. I so much certainly will make certain to don’t put out of your mind this site and give it a look regularly. Stumble upon side with soon. Thanks for sharing superb informations. Your website is so cool. I am impressed by the details that you have on this blog. It reveals how nicely you perceive this subject. Bookmarked this website page, will come back for more articles. You, my friend, ROCK! I found just the information I already searched everywhere and simply could not come across. What a perfect site. This web site can be a walk-by way of for all the data you wanted about this and didn’t know who to ask. Glimpse right here, and also you’ll positively discover it. Its such as you learn my thoughts! You seem to understand a lot about this, like you wrote the ebook in it or something. I feel that you just could do with a few percent to pressure the message house a little bit, however instead of that, that is great blog. A fantastic read. I’ll definitely be back. You have mentioned very interesting details! ps nice web site. “There’s always one who loves and one who lets himself be loved.” by W. Somerset Maugham. you are really a good webmaster. The site loading velocity is amazing. It sort of feels that you are doing any unique trick. Also, The contents are masterpiece. you’ve done a fantastic job in this matter! Please let me know if you’re looking for a article author for your blog. You have some really good articles and I believe I would be a good asset. If you ever want to take some of the load off, I’d love to write some articles for your blog in exchange for a link back to mine. Please shoot me an e-mail if interested. Cheers! Really nice style and wonderful subject matter, nothing at all else we need : D.
obviously like your website but you have to check the spelling on several of your posts. A number of them are rife with spelling problems and I to find it very bothersome to inform the reality then again I’ll surely come again again. With every little thing which appears to be developing throughout this area, all your perspectives are generally quite exciting. However, I appologize, because I do not give credence to your whole plan, all be it exciting none the less. It would seem to everyone that your remarks are generally not entirely validated and in simple fact you are generally yourself not really entirely confident of your assertion. In any case I did appreciate looking at it. Outstanding post, I believe people should acquire a lot from this web blog its real user pleasant. I’ve been surfing online more than 3 hours nowadays, yet I never discovered any fascinating article like yours. It is pretty worth sufficient for me. Personally, if all site owners and bloggers made excellent content material as you did, the web can be much more useful than ever before. Thanks for every one of your effort on this site. Gloria enjoys participating in investigations and it’s really obvious why. Almost all learn all concerning the lively method you convey effective tactics through the blog and even attract contribution from people on the area plus my daughter is now understanding a lot. Enjoy the remaining portion of the new year. You’re carrying out a glorious job. hi!,I love your writing so much! share we communicate more approximately your article on AOL? I require a specialist on this area to resolve my problem. May be that is you! Having a look forward to peer you. whoah this blog is fantastic i love studying your articles. Stay up the good paintings! You recognize, many persons are hunting around for this info, you could help them greatly. I have been browsing on-line more than 3 hours lately, yet I by no means discovered any interesting article like yours. It¡¦s lovely value enough for me. In my opinion, if all site owners and bloggers made good content material as you did, the net will probably be much more helpful than ever before. Thank you a lot for giving everyone an exceptionally breathtaking chance to discover important secrets from this website. It’s usually very nice and also full of a lot of fun for me and my office fellow workers to visit your web site really 3 times every week to find out the new guides you have. And definitely, I’m so usually amazed concerning the fantastic strategies you serve. Some 4 tips in this post are undoubtedly the most impressive we’ve had. Great awesome issues here. I am very happy to peer your post. Thanks so much and i’m having a look ahead to contact you. Will you kindly drop me a mail? Thanks for some other informative website. Where else may I am getting that kind of information written in such a perfect way? I have a mission that I’m simply now running on, and I have been on the glance out for such info. Thank you for any other wonderful article. Where else may anybody get that type of info in such an ideal method of writing? I’ve a presentation subsequent week, and I’m on the look for such info. My spouse and i were fulfilled when Emmanuel managed to finish up his survey by way of the precious recommendations he received using your weblog. It is now and again perplexing to simply find yourself giving for free things that many people may have been trying to sell. And now we realize we now have you to appreciate for that. Those illustrations you have made, the easy site navigation, the relationships your site give support to foster – it is everything awesome, and it’s really aiding our son in addition to the family know that that matter is entertaining, which is rather pressing. Thanks for all! What i do not realize is actually how you are not actually much more well-liked than you may be now. You’re very intelligent. You recognize therefore significantly on the subject of this subject, made me individually believe it from a lot of varied angles. Its like women and men are not interested except it¡¦s one thing to accomplish with Girl gaga! Your individual stuffs excellent. At all times care for it up! I do agree with all the concepts you’ve introduced in your post. They’re really convincing and will certainly work. Still, the posts are too short for beginners. Could you please lengthen them a little from next time? Thanks for the post. You actually make it appear really easy together with your presentation but I in finding this matter to be really something which I believe I would never understand. It sort of feels too complex and extremely vast for me. I’m looking ahead to your next submit, I will attempt to get the grasp of it! hi!,I really like your writing very much! share we keep up a correspondence more approximately your article on AOL? I need an expert on this house to solve my problem. May be that’s you! Taking a look ahead to look you. Valuable info. Lucky me I discovered your website by accident, and I’m stunned why this accident didn’t took place in advance! I bookmarked it. wonderful issues altogether, you simply gained a logo new reader. What would you suggest in regards to your submit that you just made some days ago? Any positive? I’ve been browsing on-line more than 3 hours these days, yet I by no means found any interesting article like yours. It¡¦s pretty value sufficient for me. In my opinion, if all web owners and bloggers made good content material as you probably did, the net can be a lot more helpful than ever before. Someone necessarily help to make severely posts I might state. This is the first time I frequented your website page and up to now? I surprised with the analysis you made to create this actual put up amazing. Great process! certainly like your website however you need to take a look at the spelling on quite a few of your posts. Several of them are rife with spelling problems and I to find it very troublesome to tell the truth on the other hand I¡¦ll surely come back again. I have to show my appreciation to this writer just for bailing me out of this challenge. Right after searching throughout the online world and finding advice that were not beneficial, I figured my life was done. Being alive minus the solutions to the difficulties you have resolved as a result of the website is a serious case, as well as those which may have in a negative way affected my entire career if I hadn’t noticed your web page. That talents and kindness in handling all the details was very helpful. I am not sure what I would have done if I hadn’t come across such a stuff like this. I am able to at this time look forward to my future. Thank you very much for the expert and amazing help. I won’t be reluctant to recommend the sites to anybody who will need guidelines on this area. Hello.This post was extremely remarkable, particularly because I was looking for thoughts on this matter last couple of days. Hey there! Someone in my Facebook group shared this website with us so I came to give it a look. I’m definitely enjoying the information. I’m book-marking and will be tweeting this to my followers! Fantastic blog and amazing style and design. Hey very nice site!! Guy .. Excellent .. Amazing .. I will bookmark your web site and take the feeds alsoKI’m glad to find so many helpful information here in the publish, we’d like work out more strategies on this regard, thanks for sharing. . . . . . I enjoy you because of all your labor on this web page. Ellie really likes carrying out internet research and it’s really easy to understand why. My partner and i notice all relating to the dynamic means you offer practical secrets via your web site and in addition boost contribution from website visitors about this point and our favorite child is really discovering a whole lot. Have fun with the rest of the year. You have been conducting a first class job. I just want to tell you that I’m beginner to blogs and actually savored you’re web page. Almost certainly I’m going to bookmark your blog . You actually have good well written articles. Bless you for revealing your webpage. hello there and thank you for your information – I’ve certainly picked up anything new from right here. I did however expertise a few technical issues using this website, since I experienced to reload the website many times previous to I could get it to load properly. I had been wondering if your hosting is OK? Not that I’m complaining, but slow loading instances times will very frequently affect your placement in google and could damage your quality score if advertising and marketing with Adwords. Anyway I’m adding this RSS to my email and could look out for a lot more of your respective exciting content. Make sure you update this again very soon..
Somebody necessarily lend a hand to make significantly articles I might state. That is the first time I frequented your web page and so far? I surprised with the research you made to create this actual put up incredible. Magnificent job! Great tremendous issues here. I¡¦m very glad to look your article. Thanks so much and i’m taking a look forward to touch you. Will you please drop me a mail? excellent post, very informative. I’m wondering why the opposite specialists of this sector don’t understand this. You must continue your writing. I’m sure, you’ve a huge readers’ base already! Thank you a lot for sharing this with all of us you really realize what you are speaking about! Bookmarked. Kindly also discuss with my website =). We could have a link exchange arrangement among us! I must show my affection for your kind-heartedness in support of women who need help with this important concept. Your very own dedication to getting the solution along has been extraordinarily productive and have always permitted men and women much like me to get to their targets. Your personal warm and friendly hints and tips indicates this much a person like me and especially to my office colleagues. Thanks a lot; from everyone of us. naturally like your web site but you need to test the spelling on several of your posts. Many of them are rife with spelling issues and I find it very troublesome to inform the reality nevertheless I will certainly come again again. I together with my friends ended up following the best tips and tricks on your web site and then the sudden got a horrible suspicion I never expressed respect to you for those tips. The men were definitely totally passionate to read all of them and have now in truth been taking pleasure in them. We appreciate you turning out to be indeed thoughtful as well as for obtaining certain useful things millions of individuals are really wanting to be aware of. Our honest regret for not expressing appreciation to you sooner. I’ve been browsing on-line more than 3 hours as of late, yet I never discovered any fascinating article like yours. It¡¦s lovely value enough for me. In my opinion, if all website owners and bloggers made excellent content material as you probably did, the net will probably be much more helpful than ever before. It¡¦s truly a great and helpful piece of information. I¡¦m satisfied that you shared this useful information with us. Please stay us up to date like this. Thanks for sharing. Thanks for some other magnificent post. The place else may just anybody get that kind of information in such a perfect method of writing? I’ve a presentation next week, and I am on the search for such information. Wonderful goods from you, man. I’ve understand your stuff previous to and you’re just extremely wonderful. I actually like what you have acquired here, certainly like what you’re saying and the way in which you say it. You make it entertaining and you still take care of to keep it smart. I can’t wait to read much more from you. This is actually a tremendous site. I will immediately grab your rss feed as I can’t in finding your e-mail subscription link or newsletter service. Do you have any? Please allow me realize in order that I could subscribe. Thanks. I do accept as true with all the ideas you’ve presented to your post. They’re very convincing and will definitely work. Still, the posts are too short for beginners. May you please lengthen them a little from subsequent time? Thank you for the post. you are actually a good webmaster. The web site loading velocity is incredible. It sort of feels that you’re doing any distinctive trick. Moreover, The contents are masterwork. you have performed a fantastic task in this subject! you’re actually a good webmaster. The web site loading speed is incredible. It sort of feels that you’re doing any unique trick. Furthermore, The contents are masterwork. you have performed a fantastic task on this subject! Wow, incredible weblog structure! How lengthy have you been running a blog for? you made running a blog glance easy. The whole glance of your site is great, let alone the content! Helpful info. Fortunate me I found your web site accidentally, and I am shocked why this coincidence did not happened earlier! I bookmarked it. Thank you, I’ve just been searching for info about this topic for a long time and yours is the best I’ve came upon till now. However, what about the conclusion? Are you certain in regards to the supply? Someone necessarily help to make seriously posts I would state. That is the first time I frequented your website page and so far? I amazed with the research you made to create this particular submit amazing. Wonderful process! Thank you a lot for sharing this with all people you really realize what you’re talking about! Bookmarked. Please also talk over with my web site =). We may have a hyperlink change contract between us! fantastic issues altogether, you just won a emblem new reader. What could you suggest in regards to your post that you simply made a few days ago? Any sure? Great tremendous things here. I¡¦m very happy to peer your article. Thanks a lot and i’m taking a look ahead to contact you. Will you please drop me a e-mail? I happen to be writing to let you be aware of what a outstanding encounter my cousin’s child gained reading your site. She discovered some details, not to mention how it is like to have an awesome coaching nature to have many people completely thoroughly grasp various tortuous matters. You actually exceeded our own desires. Thanks for offering such valuable, dependable, informative and even cool thoughts on that topic to Julie. Hello there, I discovered your site via Google even as searching for a comparable topic, your site got here up, it seems good. I’ve bookmarked it in my google bookmarks. I would like to thank you for the efforts you have put in writing this web site. I’m hoping the same high-grade blog post from you in the upcoming also. In fact your creative writing skills has encouraged me to get my own web site now. Really the blogging is spreading its wings fast. Your write up is a good example of it. Thanks a bunch for sharing this with all of us you really realize what you’re talking about! Bookmarked. Kindly additionally consult with my site =). We will have a hyperlink trade arrangement between us! I would like to express my appreciation for your generosity in support of visitors who require help with this one idea. Your personal dedication to passing the message all over appeared to be surprisingly productive and have frequently helped associates much like me to reach their desired goals. Your new important suggestions implies a lot a person like me and a whole lot more to my office workers. Thanks a lot; from all of us. hi!,I like your writing so so much! proportion we communicate extra about your article on AOL? I require an expert on this area to unravel my problem. Maybe that is you! Taking a look ahead to see you. fantastic points altogether, you simply won a logo new reader. What may you recommend in regards to your put up that you just made some days in the past? Any certain? I have read a few good stuff here. Definitely price bookmarking for revisiting. I wonder how a lot effort you set to make such a excellent informative website. Hiya very cool site!! Guy .. Excellent .. Amazing .. I will bookmark your site and take the feeds also¡KI’m glad to search out numerous helpful information right here in the publish, we’d like work out more techniques on this regard, thanks for sharing. . . . . .
I’ve been browsing online greater than 3 hours these days, but I never discovered any fascinating article like yours. It¡¦s pretty worth enough for me. Personally, if all website owners and bloggers made excellent content as you did, the web will probably be a lot more useful than ever before. Magnificent web site. Plenty of useful info here. I¡¦m sending it to some friends ans additionally sharing in delicious. And obviously, thank you on your effort! I’ve been surfing on-line greater than 3 hours these days, but I by no means found any interesting article like yours. It is pretty worth enough for me. In my opinion, if all web owners and bloggers made just right content material as you probably did, the web will be a lot more useful than ever before. I want to express appreciation to you just for rescuing me from this instance. Right after researching throughout the world-wide-web and seeing basics which were not productive, I assumed my life was done. Living without the approaches to the issues you have sorted out by means of your entire post is a crucial case, as well as the ones which might have badly damaged my career if I had not come across your website. Your understanding and kindness in playing with the whole thing was invaluable. I am not sure what I would’ve done if I hadn’t discovered such a solution like this. I can at this moment look ahead to my future. Thanks a lot very much for this high quality and result oriented help. I will not hesitate to recommend your web blog to any person who wants and needs care on this matter. Nice post. I was checking continuously this blog and I’m impressed! Extremely useful info particularly the last part 🙂 I care for such information much. I was seeking this certain info for a long time. Thank you and good luck. I and my buddies were checking out the excellent tips on your site and then unexpectedly developed a terrible suspicion I never thanked the blog owner for those techniques. Most of the boys ended up consequently stimulated to read them and have now without a doubt been using them. I appreciate you for indeed being very considerate as well as for pick out this kind of nice subject matter millions of individuals are really desperate to be aware of. Our sincere regret for not saying thanks to sooner. Hello, everything is going perfectly here and ofcourse every one is sharing information, that’s truly excellent, keep up writing. You actually make it appear really easy along with your presentation however I in finding this matter to be really one thing that I think I might never understand. It kind of feels too complicated and very large for me. I am having a look forward for your next put up, I¡¦ll attempt to get the cling of it! My spouse and i got absolutely thankful when Raymond could carry out his inquiry from your precious recommendations he was given while using the blog. It’s not at all simplistic to just happen to be giving away tips and tricks which usually the rest might have been making money from. And we understand we have got the writer to appreciate for this. The specific explanations you made, the easy site menu, the relationships you help create – it’s got all wonderful, and it is leading our son in addition to our family reckon that this concept is exciting, which is extremely indispensable. Thank you for the whole lot! My husband and i were so ecstatic that Albert could conclude his inquiry from the ideas he obtained from your own web pages. It is now and again perplexing to just always be giving freely tactics which the rest have been trying to sell. Therefore we fully understand we now have the blog owner to thank for that. The specific explanations you have made, the straightforward site navigation, the friendships your site help promote – it’s all incredible, and it’s making our son in addition to the family do think this theme is thrilling, and that’s highly serious. Many thanks for the whole lot! Thank you for sharing excellent informations. Your web-site is so cool. I’m impressed by the details that you¡¦ve on this website. It reveals how nicely you understand this subject. Bookmarked this web page, will come back for extra articles. You, my pal, ROCK! I found just the info I already searched all over the place and simply couldn’t come across. What an ideal web site. what you’re talking about! Bookmarked. Please additionally consult with my website =). Thank you for sharing superb informations. Your site is so cool. I am impressed by the details that you have on this blog. It reveals how nicely you perceive this subject. Bookmarked this website page, will come back for extra articles. You, my friend, ROCK! I found just the information I already searched all over the place and just couldn’t come across. What a perfect website. Thank you, I have just been searching for info about this topic for ages and yours is the best I have discovered so far. But, what concerning the bottom line? Are you certain in regards to the supply? Magnificent site. Plenty of helpful info here. I¡¦m sending it to several friends ans also sharing in delicious. And of course, thanks on your effort! Appreciation to my father who informed me regarding this website, this webpage is really awesome. What i do not realize is in truth how you’re now not actually a lot more smartly-favored than you may be now. You’re so intelligent. You understand thus considerably relating to this matter, produced me for my part imagine it from numerous various angles. Its like women and men are not fascinated unless it is one thing to accomplish with Woman gaga! Your personal stuffs nice. At all times maintain it up! Somebody essentially assist to make critically articles I’d state. This is the first time I frequented your web page and so far? I amazed with the analysis you made to make this particular submit extraordinary. Excellent job! Whats Taking place i am new to this, I stumbled upon this I’ve found It absolutely useful and it has aided me out loads. I am hoping to give a contribution & aid other users like its helped me. Good job. I’m just commenting to make you know of the wonderful encounter my friend’s princess experienced reading through your site. She came to find lots of things, which included how it is like to possess a great giving mindset to get other individuals completely know just exactly some impossible issues. You really did more than people’s desires. Thank you for giving such valuable, trustworthy, edifying and in addition cool tips on your topic to Tanya. I have to show my thanks to you for rescuing me from such a matter. Right after browsing through the search engines and getting basics which are not powerful, I believed my life was done. Being alive devoid of the solutions to the difficulties you have sorted out as a result of this site is a serious case, and ones that might have negatively damaged my entire career if I had not discovered the website. Your main talents and kindness in playing with all things was vital. I’m not sure what I would have done if I hadn’t encountered such a subject like this. I’m able to at this time look ahead to my future. Thanks very much for the specialized and result oriented help. I will not be reluctant to endorse your site to anyone who ought to have guidelines about this topic. Thank you for the good writeup. It in fact was a leisure account it. Glance advanced to far added agreeable from you! However, how could we keep in touch? I have to get across my passion for your generosity supporting people that require assistance with this one topic. Your personal commitment to getting the message all-around had been remarkably beneficial and has continually encouraged guys and women like me to reach their objectives. Your interesting guideline indicates a whole lot to me and even further to my fellow workers. Many thanks; from all of us. Wow, fantastic weblog layout! How long have you been blogging for? you make running a blog look easy. The entire glance of your site is excellent, let alone the content material! Thank you for another informative website. Where else may just I get that kind of information written in such an ideal manner? I’ve a challenge that I am just now working on, and I have been at the look out for such info. Hello there, I discovered your web site by way of Google at the same time as looking for a related topic, your site got here up, it appears great. I’ve bookmarked it in my google bookmarks. Good ¡V I should definitely pronounce, impressed with your site. I had no trouble navigating through all the tabs as well as related info ended up being truly easy to do to access. I recently found what I hoped for before you know it at all. Quite unusual. Is likely to appreciate it for those who add forums or something, site theme . a tones way for your customer to communicate. Nice task..
My spouse and i were so thankful when Albert managed to do his basic research from your ideas he made from your very own blog. It is now and again perplexing just to find yourself giving for free helpful hints that many the rest may have been trying to sell. And now we grasp we have got the blog owner to thank because of that. These illustrations you made, the easy blog navigation, the relationships you make it easier to promote – it is many awesome, and it’s letting our son in addition to the family recognize that the issue is amusing, which is especially vital. Thanks for the whole thing! It is in reality a great and helpful piece of info. I am satisfied that you just shared this useful info with us. Please stay us up to date like this. Thank you for sharing. A lot of thanks for each of your work on this website. My mum take interest in setting aside time for research and it’s really easy to see why. Most of us learn all relating to the powerful means you produce insightful tricks via this blog and welcome response from other people on the area of interest so our favorite child is without question being taught a lot of things. Take advantage of the rest of the year. You’re carrying out a good job. I love what you guys are usually up too. Such clever work and coverage! Keep up the amazing works guys I’ve included you guys to my personal blogroll. Wow, marvelous blog format! How long have you ever been running a blog for? you make running a blog glance easy. The full glance of your site is wonderful, let alone the content! I am really thankful to the holder of this site who has shared this impressive article at at this time. certainly like your web site however you need to test the spelling on quite a few of your posts. A number of them are rife with spelling problems and I find it very bothersome to inform the truth however I will surely come again again. Hiya, I am really glad I have found this information. Today bloggers publish only about gossips and net and this is actually irritating. A good website with exciting content, that is what I need. Thanks for keeping this website, I will be visiting it. Do you do newsletters? Can not find it. Thanks a lot for sharing this with all of us you really recognize what you’re talking approximately! Bookmarked. Kindly additionally talk over with my web site =). We will have a hyperlink alternate arrangement among us! I cling on to listening to the newscast lecture about getting free online grant applications so I have been looking around for the most excellent site to get one. Could you advise me please, where could i find some? What i don’t understood is in reality how you are not actually much more neatly-liked than you may be right now. You’re very intelligent. You already know therefore considerably in relation to this topic, made me personally believe it from a lot of various angles. Its like men and women aren’t involved until it¡¦s one thing to do with Woman gaga! Your individual stuffs excellent. All the time care for it up! Thanks for sharing superb informations. Your website is so cool. I’m impressed by the details that you have on this site. It reveals how nicely you understand this subject. Bookmarked this web page, will come back for more articles. You, my friend, ROCK! I found simply the info I already searched all over the place and just could not come across. What an ideal web site. Thanks a lot for giving everyone a very marvellous possiblity to check tips from here. It is usually very fantastic and as well , stuffed with a lot of fun for me personally and my office peers to visit the blog at a minimum thrice in 7 days to see the latest guides you will have. Not to mention, we are certainly fulfilled with your powerful inspiring ideas you give. Certain 1 points in this post are honestly the most effective I’ve had. fantastic issues altogether, you simply received a new reader. What may you recommend in regards to your put up that you just made some days ago? Any positive? I’m writing to make you understand of the superb experience our girl found browsing the blog. She discovered a good number of details, most notably what it is like to have an awesome helping character to have folks without problems comprehend certain impossible topics. You really did more than our desires. Many thanks for offering the productive, healthy, informative not to mention unique tips about your topic to Evelyn. hi!,I like your writing so a lot! proportion we communicate more about your article on AOL? I require an expert in this space to resolve my problem. May be that is you! Taking a look ahead to look you. Hello, Neat post. There is an issue along with your site in internet explorer, might check this¡K IE still is the marketplace chief and a huge part of other people will omit your great writing because of this problem. Hiya, I am really glad I have found this info. Today bloggers publish only about gossips and internet and this is actually frustrating. A good blog with exciting content, this is what I need. Thanks for keeping this site, I will be visiting it. Do you do newsletters? Can’t find it. Great post. I was checking constantly this blog and I’m impressed! Very helpful information specifically the last part 🙂 I care for such info much. I was seeking this particular info for a very long time. Thank you and good luck. Thank you for sharing superb informations. Your website is so cool. I am impressed by the details that you have on this web site. It reveals how nicely you perceive this subject. Bookmarked this website page, will come back for more articles. You, my pal, ROCK! I found just the info I already searched everywhere and simply couldn’t come across. What an ideal web-site. hello!,I like your writing very much! share we be in contact extra about your post on AOL? I need a specialist in this house to unravel my problem. May be that is you! Taking a look forward to peer you. I was just seeking this info for some time. After six hours of continuous Googleing, at last I got it in your web site. I wonder what is the lack of Google strategy that do not rank this type of informative sites in top of the list. Usually the top sites are full of garbage. hi!,I love your writing so a lot! proportion we keep in touch extra about your post on AOL? I need an expert in this house to solve my problem. Maybe that’s you! Taking a look ahead to peer you. you are really a good webmaster. The web site loading speed is amazing. It seems that you are doing any unique trick. Moreover, The contents are masterwork. you have done a fantastic job on this topic! Greetings! This is my 1st comment here so I just wanted to give a quick shout out and tell you I truly enjoy reading through your articles. Can you suggest any other blogs/websites/forums that go over the same subjects? Thanks a ton! I have learn some just right stuff here. Certainly worth bookmarking for revisiting. I surprise how much effort you place to make this sort of wonderful informative website. I’m curious to find out what blog platform you’re using? I’m having some small security issues with my latest blog and I’d like to find something more secure. Do you have any recommendations? Very interesting details you have mentioned, thanks for putting up. “The earth has music for those who listen.” by William Shakespeare. I truly wanted to post a simple message in order to appreciate you for all the awesome recommendations you are giving out here. My time-consuming internet lookup has now been rewarded with professional points to go over with my friends and classmates. I would repeat that we visitors are undoubtedly lucky to live in a decent website with very many wonderful individuals with good concepts. I feel somewhat privileged to have seen your entire web pages and look forward to some more awesome moments reading here. Thank you again for all the details. What i don’t realize is in reality how you’re now not actually a lot more smartly-appreciated than you may be right now. You’re so intelligent. You know thus significantly with regards to this topic, made me in my opinion imagine it from so many various angles. Its like men and women don’t seem to be fascinated until it¡¦s something to accomplish with Girl gaga! Your individual stuffs nice. At all times handle it up! 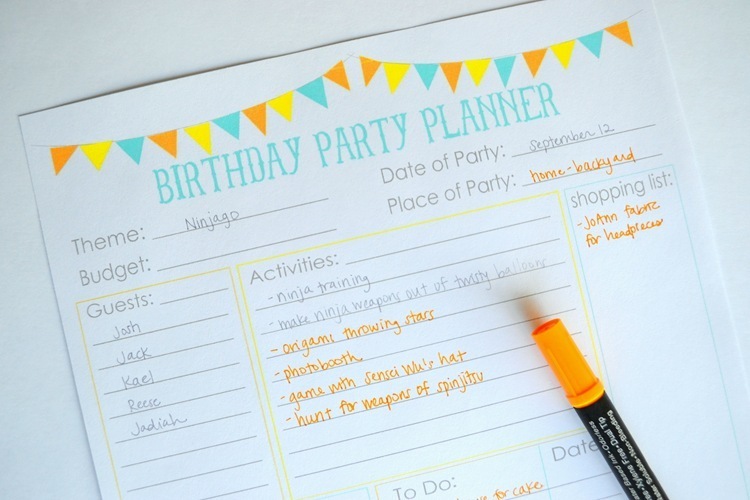 Stress-Free Kids’ Birthday Party (or Family Celebration) by Jenn Hultz <Loved it! Wonderful goods from you, man. I have understand your stuff previous to and you are just too fantastic. I actually like what you’ve acquired here, really like what you are stating and the way in which you say it. You make it enjoyable and you still care for to keep it smart. I cant wait to read much more from you. This is really a great web site. I would like to point out my admiration for your generosity for visitors who need guidance on in this subject. Your personal commitment to passing the message up and down had been exceptionally advantageous and have frequently made most people much like me to reach their objectives. This useful tutorial indicates this much to me and even further to my fellow workers. Thanks a ton; from everyone of us. Wow, marvelous blog structure! How lengthy have you ever been blogging for? you made running a blog glance easy. The total look of your site is great, let alone the content material! Thanks , I’ve just been searching for information approximately this subject for ages and yours is the greatest I have came upon till now. However, what concerning the bottom line? Are you sure about the supply? I’ve been browsing online greater than 3 hours these days, but I never discovered any attention-grabbing article like yours. It is pretty price sufficient for me. Personally, if all site owners and bloggers made excellent content material as you probably did, the web shall be a lot more helpful than ever before. site rather a lot up fast! What host are you the use of? I am also commenting to let you know of the magnificent experience my friend’s daughter had browsing your web site. She even learned lots of pieces, including how it is like to possess a great coaching heart to let the mediocre ones clearly know several multifaceted subject matter. You really surpassed readers’ desires. Thanks for offering those practical, trusted, informative not to mention easy tips on the topic to Emily. Hello, Neat post. There is an issue along with your site in web explorer, might check this¡K IE nonetheless is the marketplace chief and a big component to other people will omit your excellent writing because of this problem. ymqhhgmaduf,A fascinating discussion is definitely worth comment. I do think that you ought to publish more on this topic, it may not be a taboo cjmkvho,subject but generally folks don’t talk about such subjects. To the next! All the best!! msyqzpasroe,Some really nice stuff on this website, I enjoy it.